Sonic the Hedgehog 16 is the fifteenth issue of the Sonic the Hedgehog comic series. It was released in November 1994. 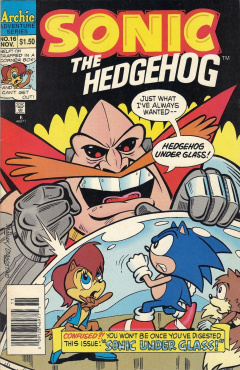 This comic features two stories: Sonic Under Glass, and The Man From H.E.D.G.E.H.O.G.. The Freedom Fighters are posing in front of a burning Robotropolis, Rotor Walrus taking a photo, with the group proclaiming victory against the tyrant Dr. Robotnik. He takes the photo, but the flash ends up exploding in Rotor's face, having used too much flash powder. The rest of the Freedom Fighters congratulate Sonic on a job well done in defeating Robotnik. Six months later, Sonic is putting on a tie on in front of a mirror. Tails enters, telling him to hurry up or he'll be late for his wedding. In another room, Sally Acorn, the bride, is trying on her gown, which she thinks doesn't feel right. Despite the thoughts, Bunnie Rabbot thinks she looks pretty in it. Unfortunately, the wedding has left one Antoine D'Coolette jealous, still having a crush on Sally. Outside, with Rotor acting as priest, the wedding begins, with Tails as best man and Bunnie as a bridesmaid. Antoine, however, is standing aside, angry about the wedding. Sonic takes Sally's hand, exclaiming that he wishes Robotnik could see them. Unknown to the Freedom Fighters, they are actually in a dome, with Robotnik watching. He gloats at his success of capturing the group with his other badniks around him. He tells the story of his ingenius plan to his robots. He first lured the group to the Sleepy Hollow (with a chili dog offer), filled the hollow with sleeping gas, and brought them back and placed them in self-containment tubes. The tubes contain virtual reality helmets that allow Robotnik to control whatever environment they are in, and watch them in a mini-state in a viewing dome. As their new life is perfect, he feels that they have no reason to escape. He changes his focus to the real world and sends out his war machines (vehicles with spiked rollers) to destroy everything in their way. He leaves the room in Crabmeat's hands as the final vows are stated in the Sonic and Sally wedding in the dome. As Rotor asks for any objections to the wedding, Sonic disappears and reappears behind Antoine holding a broom, much to Antoine's amusement. Suddenly, the whole area turns psychedelic as Sally gets stuck in a hole and melting clocks appear everywhere, which pleases Antoine. At a nearby door, two figures enter the room: Uncle Chuck and Muttski. Sonic walks over and asks how they came to be, in which Uncle Chuck informs him that anything is possible in virtual reality. Sonic's virtual world turns into a reality with a lack of physics and many melting clocks. He asks Uncle Chuck for some easy answers on how he and Muttski are not robots and how he became a janitor at his own wedding. The world suddenly turns to a regular grassy land with Uncle Chuck behind a booth labelled 'free easy answers'. Uncle Chuck tells Sonic about how he was duped into believing the virtual world he is in, making everything sense to him. Sonic calls up a computer terminal, which he uses to see what Robotnik is up to in the real world. He looks on as he sees Robotnik sitting back, watching his war machines destroying Mobius. He looks down at his friends, who are all happy, Antoine now swooning Sally and Rotor relaxing. With Uncle Chuck and Muttski back, or rather, facsimiles, Sonic has no idea what to do. With some encouragement by Uncle Chuck, Sonic gets an idea. He returns to the computer terminal, and gets to work on his plan. The war machines Robotnik has sent out suddenly turn around. A frightened Robotnik asks who did it, when the screen turns to static, and shows Sonic wearing 3-D glasses. He notifies Robotnik that he has taken control of not only his computer screen, but the war machines themselves. The war machines make their way toward Robotropolis, giving Sonic the upper hand in the situation. He demands that Robotnik free the Freedom Fighters or he'll destroy Robotropolis with the machines. With no other option, Robotnik gives up and releases the Freedom Fighters from their virtual reality tubes. Sally, looking around, asks where Sonic is, but Sonic refuses to leave the virtual reality until he finishes one more task. He sets the war machines on a collision course for each other and destroys them. With the job done, Sonic escapes his virtual reality by spindashing through the screen, into Robotnik's badniks, and out of the room. Robotnik, though defeated, vows to continue the war against Sonic and the others. He orders the roboticized Uncle Chuck and Muttski to clean the room of the mess left from Sonic and the virtual reality tubes. Outside of Robotropolis, Sally hugs Sonic, thinking he wasn't going to return. Although he enjoyed virtual reality, he would rather not stay there under Robotnik's terms. Tails asks Sonic about getting Uncle Chuck back, which Sonic plans to do, and when he does, it'll be for keeps. Robotnik is angry from his numerous losses at the hands of Sonic and the Freedom Fighters, leading him to think they need to track down their head of secret intelligence. His nephew, Snively, asks why this is so. Robotnik points at numerous operations that he has developed, but have failed, noting that there must be a mole in Robotropolis. After much snooping and digging, Snively and Crabmeat have found the mole, literally a mole. They tie him to an interrogation surface, with Robotnik demanding who the Freedom Fighters' head of secret intelligence is. The mole tells him that he is right, making Robotnik retort 'what?!'. The mole repeats himself, saying not 'what', but 'who'. He orders his Swatbots to take the mole away, and develops an idea. He gets some other Swatbots to roll in a 'wheel of misfortune'. If he doesn't know what he's going to do next, then Sonic won't either, giving him an edge in his war. He rolls the wheel and lands on 'undersea bank heist'. Underwater, at a secure safe door, Coconuts and Jaws use a drill to penetrate the safe. They get through the safe locks and open it up, revealing nothing but a note on a hook telling the two to look behind them. They look, as they see the Freedom Fighters behind them, armed and ready to fight. "WHO knows what evil lurks in the heart of Robotnik?" "The OWLS are not what they seem! XOXOXO"
Having been thwarted three times, despite the random wheel choices, he fully believes there's a mole in his organization, and decides to take Sonic out himself. That night, an elaborately dressed Sonic and Sally go to the Renobotnik casino to enjoy a night out. Sally asks him if he wants to try the slot machines, but Sonic would rather try out the card games. They arrive at a poker table, where a few badniks are playing, but Sally feels like they're being watched. As he takes a seat and starts playing, her suspicions are right, as Robotnik and Crabmeat watch them play. The dealer asks Sonic if he would like a card. He says to go ahead, and receives the card, which says 'Duck!' He ducks, just as a hat flies over him, hitting Grounder instead. A karate-fighting Swatbot arrives and engages Sonic in battle, who easily dodges the robot's moves. He runs circles around the bot, and touches it, overloading it with static electricity. Unfortunately, the electricity also knocks out Sonic, who falls onto a moving platform. Sonic comes to, only to find himself held against his will tied to the Wheel of Misfortune. He demands to know the head of his secret intelligence agency, or face elimination. A whole series of weapons face Sonic, who refuses to answer him. The weapons fire, just as the lights turn off. The lights turn back on, to show a hole in the shape Sonic's silhouette on the burned wheel. Behind the wheel, a candid camera appears. Robotnik complains as the wheel falls on him, after all that he has done, he still does not know the head of the Freedom Fighters' intelligence agency. Sonic and Sally arrive at their secret intelligence agency, where Sonic thanks their head of intelligence for planting the camera on the wheel. The head is one Harvey Who, an owl. Sonic then asks him one question: how many licks does it take to get to the chewy centre of a lollipop. Harvey, however, states that that information is classified. Uncle Chuck and Muttski make their first in-person appearance. This is the first issue in the Archie comic series to use Sally's correct color style. Scratch, Grounder (though colored purple, but colored yellow in his last appearance in the first story. His color is correct in the second story) and Coconuts make their reappearance in this issue. VertiCAL and HorizontAL make a brief appearance in Sonic's virtual world. The surreal environment made by the thoughts of Antoine is based on the Salvador Dali work of art The Persistence of Memory. Uncle Chuck's 'free easy answers' booth is based off of Lucy van Pelt's psychiatric booth from the Peanuts comic series. Sonic's phrase, "Go ahead...make my day! ", in response to receiving a card while playing poker, is based on the same line spoken by Clint Eastwood in Sudden Impact. The Man from H.E.D.G.E.H.O.G. has many references to the James Bond series of novels and films, including the plans that Robotnik show to Snively that have all failed (Moonraker, Thunder Ball, Goldfinger and Dr. No), the interrogation of the mole, the secret intelligence agency (referencing the MI6), Sonic (the hero) going to a casino with Sally (the girl) and playing poker, the hat thrown at Sonic while playing poker (referencing Oddjob from Goldfinger, whom is also mentioned by Sonic), witty one-liners (even in the face of danger), and Sonic being captured by Robotnik while unconscious and held against his will. One of the weapons aimed at Sonic while on the Wheel of Misfortune is based on a phaser from Star Trek. The first hint in regard to the Sally miniseries is made in the Sonic-grams section of this issue.